After Lara Gut kick-started the new women’s World Cup season with victory on Saturday, Sunday saw the men take to the slopes on the Rettenbach Glacier in Soelden, Austria, for a giant slalom race. And it was Alexis Pinturault who sounded the early warning bells to his rivals with victory. The Frenchman was fastest in both the morning and afternoon runs to claim the first win of the season. Having finished runner-up to Marcel Hirscher in the discipline standings for the past two years his triumph on the icy slopes in Austria has set the tone for another thrilling season-long battle for the title with his Austrian rival, who was second on the day. After the race Hirscher – a five-times Overall World Cup winner – said he was ‘‘super happy’‘ with his runners-up finish, especially after a near crash mid-way through the second run. 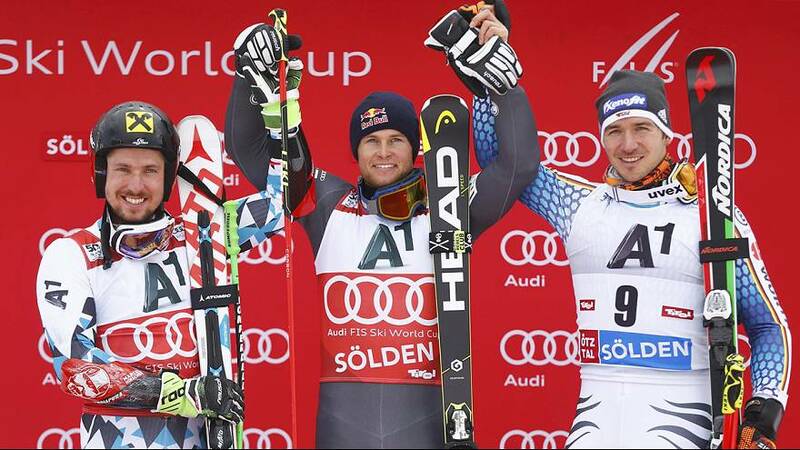 Felix Neureuther of Germany rounded out the Soelden podium with a confidence-boosting third place. The 32-year-old slalom specialist, who has suffered with chronic back pain for several seasons, produced a solid performance and crossed over 1.37 seconds behind Pinturault. The next World Cup event takes place in a fortnight in Levi, Finland.